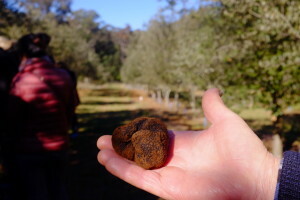 Who knew you could go truffle hunting in New South Wales! I consider myself a ‘gourmand’ and take pride in knowing where my food comes from, yet I did not know that truffles could be found in NSW. 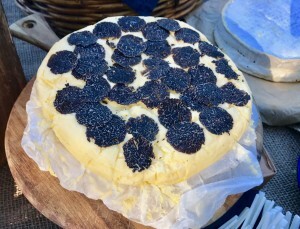 I knew that truffles were cultivated in Western Australia but not in the Southern Highlands, just an hour out of Sydney. I must admit I also did not know that Australia was the 4th largest truffle producer in the world- black French Perigord ones at that! 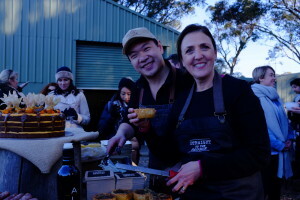 On Saturday, myself and a dozen other gourmands led by, Straight to the Source, went on a journey to the Southern Highlands in New South Wales to discover where New South Wales truffles come from. A little background info about our host Straight to the Source before I get to your story. Tawnya Bahr, a trained chef and food expert (expert should be in caps, Tawnya really knows her stuff!) takes chefs and foodies to diverse regions in Australia to discover where the country’s finest ingredients come from. You really must do one of Tawnya’s tours once in a lifetime! Our day started at Black Star Pastry in Sydney’s unassuming gourmet food hub, Rosebery. Black Star Pastry owner and Patissier Chris Thé , and Straight to the Source’s Tawnya Bahr are our hosts for the day. Chris Thé has a serious passion for learning the source of his ingredients. I could not think of a better partner for Straight to the Source than Chris. Chris regularly visits the Yuzu farm in Japan where he sources the Yuzu (a Japanese citrus which is a cross between a lemon and a grapefruit) for his Black Sesame and Yuzu Cake. Next year he plans to visit Iran to discover where the rose petals used in his famed Strawberry watermelon Cake come from. Now that’s commitment! Chris recently returned from Osaka where he spent time with the iconic Japanese company, Choya, producers of Ume Shu (plum wine). 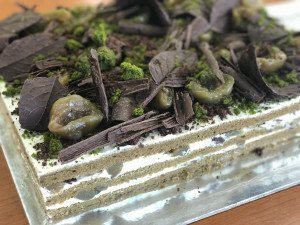 Later this year, Black Star will launch a special ‘Choya’ cake in celebration of the sweet, pickled-plum liquor. I adore Ume Shu and cannot wait to try this -watch this space. We board the luxury bus, on the way to our next destination, we are introduced to Lucy, also from Straight the the Source. Lucy’s resume reads like the ‘Good Food Guide’, having worked with some of Sydney’s best chefs. I know I am in good hands with Straight the the Source. First stop, two-hatted Biota Dining Room in the Southern Highlands. Chef James Viles, a pioneer of farm to table has created the ultimate ‘foodie’ destination on this Bowral property. The farm to table theme runs throughout from the hand-made smoke house and the farm with every ingredient used in the restaurant come from within from local producers. As we walk into the dining room we are greeted with a glass of Australian sparkling wine with lemon verbena, grown on the property. 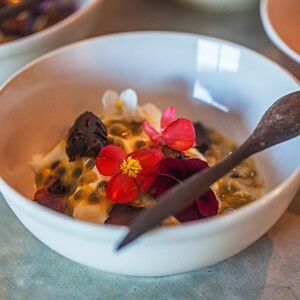 Stand out breakfast dishes at Biota were sheep’s cheese yogurt with locally-produced cumquat jam and edible flowers. Mud crab and creamy scrambled eggs on a freshly baked local bun prepared by James and his team, are a surprising, yet delicious combination. As we make our way to our next destination, Yelverton Truffle Farm, myself and the other guests swap dining stories. The entire group are passionate ‘foodies’ and by the time we arrive at the Truffle Farm it feels like I’m on an adventure with close friends. I could not think of a better bunch of people I would like to spend the day with! I pride myself on knowing where my food comes from, and I have mentioned I was unaware that Australia is one of the top truffle producers in the world. As we arrive at Yelverton Truffle Farm, I wonder, if Australia is one of the top producers, who assists in finding the truffles? I know that Italian white truffles are found with the assistance of the teddy-bear like dog, Lagotto Romano. I had heard of truffle farms using dacshunds. Pigs were originally used. The problem being that pigs eat the truffles whereas dogs do not, making them the perfect hunting companion. Imagine my surprise when I learned that Australian cattle dogs found the truffles at the Yelverton Truffle Farm! 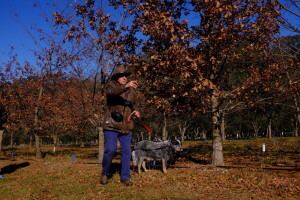 Jet and Belle, the two cattle dogs who live and work on the Truffle Farm have been trained to snuffle out the truffles. They get the scent then lead truffle farmer, Ted to the where the truffles are located beneath the soil and sit right on the spot. Truffles, priced between $2000-$3000 per kilo for the black French Perigord variety are extremely precious. Excavating for truffles is intricate and detailed work. After Jet and Belle find the exact location, Ted carefully gets to work. Black Perigord Truffles require a perfect environment to be cultivated. I, like many thought that all one needed to cultivate truffles was a few Oak trees, I was wrong. Owner and truffle farmer Ted of Yelverton Truffles confirms this. Ted informs us that truffles are best grown over limestone, which he has placed throughout the grounds. 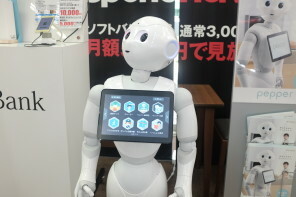 We learn there is a high possibility that truffles will not occur. Ted and Barbara of Yelverton Truffle Farm know this all too well. It took at least 10 years before they cultivated their first truffle. Ted makes it clear, that although the high-priced truffle industry may seem lucrative, it’s not a quick-buck game. Luckily Ted and Barbara have reaped the rewards from starting their truffle farm, in 2014 unearthed a record-breaking 1172g truffle. 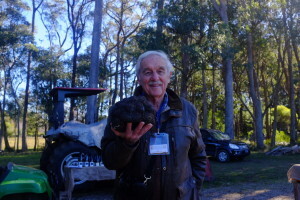 This is the largest truffle ever found in Australia. Truffles, whether naturally occurring or cultivated are still incredibly rare, making them a delicacy and the reason why they are associated with opulence and fine dining, carefully shaved over dishes. Truffles were not always so rare and opulent, 2000 years ago they were roasted and enjoyed whole. I was born in the wrong century! I have gone right into about how to cultivate and harvest this fine fungi, yes that’s right, for those who didn’t already know truffles are a fungi. A very expensive, delicious fungi. Now to the truffle-laden lunch. 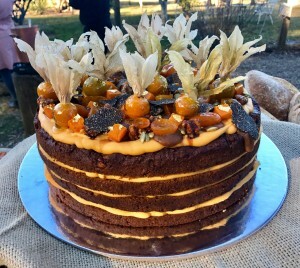 Our truffle-laden lunch, expertly prepared by Straight to the Source and Black Star Pastry, includes piping hot creamy soup with freshly shaved black truffles, truffle quiche and a spiced-pumpkin cake with candied gooseberries and truffles (pictured below). I have never experienced such a generous abundance of black French Perigord Truffles in my life! I think back to the last dish I ate featuring black truffles, scallops with shaved truffles at Nobu Malibu in Los Angeles. They only had a sliver of the stuff compared to this lunch. The table is full to the edges with a double wheel of brie and a wheel of fresh butter, both covered in freshly grated black truffles. Already satiated from the truffle-laden lunch, I go in for one last slice of fresh bread and truffle covered cheese. It doesn’t help that every time I turn around Tawnya and co are expertly grating fresh black truffles over everything on the table creating an indulging feast for the senses. I have died and gone to truffle heaven! Truffle hunting in NSW with Straight to the Source has been my stand-out, hands-down, favorite gourmet experience to date. 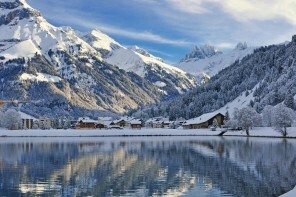 This tour topped even eating at the world’s best 3-michelin star restaurants, where I guarantee you do not get even a fraction of the truffles as you will at this exquisite experience. Tours are rare and tickets sell fast, so be quick! If you miss out on the July tour, check the link above for more tours. Departing from Black Star Pastry in Rosebery we will travel south to Biota Dining in Bowral for morning tea and a kitchen garden tour before heading to Yelverton Truffles, where a record-breaking 1172g truffle was unearthed in 2014, and another beauty, weighing-in at 966g, was dug up in 2015. Not only will you experience the thrill of a truffle hunt alongside specially trained dogs, you will also be treated to an exclusive cooking demonstration by renowned Black Star Pastry owner and patissier, Christopher Thé. This will be followed by a truffle-laden lunch, where fresh black Perigord truffles will feature in abundance, complimented with wine pairings from Tertini Winery. 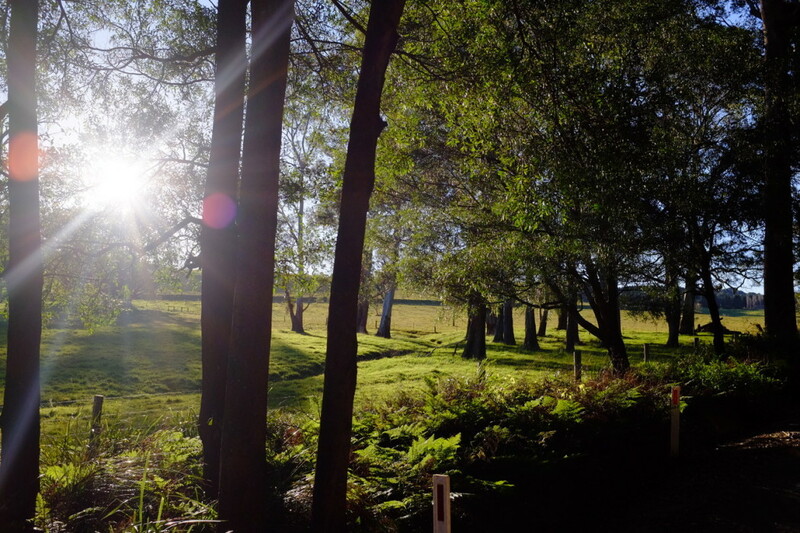 I hope you enjoyed this post on Truffle Hunting in NSW Australia. Have you been truffle hunting? 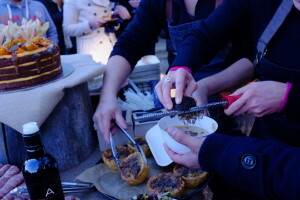 What is your favorite dish you have had featuring truffles? Comment below.